How good could a band who never released a recording during their original life be? In the case of Dieuf-Dieul De Thies (pictured above), the answer is "on par with the best-known Senegalese artists of their day: Orchestra Baobab and Etoile De Dakar." 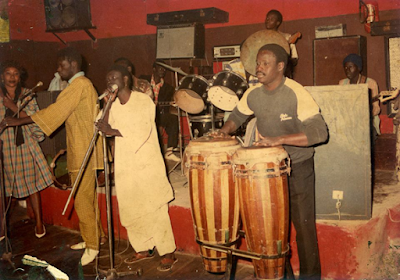 Volume 2 of Dieuf-Dieul's original 1981-82 sessions has just been issued by Teranga Beat Records; you'll hear a nice long, spacious selection from it on this week's program. 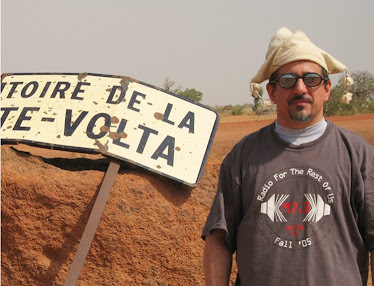 By the way, the band's original members are so excited about their 30-year-delayed career as recording artists that they've reunited to gig in Senegal and are hoping to tour Europe and the USA next year. More power to them! Also this week: dub and blues, two great tastes that taste great together; the newest Balkan beats from Germany, Bosnia, Moldova and Washington DC; and 21st century Afrobeat.